What do editors and agents mean when they ask for a "short bio"? For writers just starting out, the idea of writing a bio, short or otherwise, to go along with their submissions to a literary journal can be daunting. What exactly are editors looking for? What if you haven’t published anything yet? Is it important to include your education, your job, your favorite ice cream flavor? Should you be cheeky, friendly or boringly professional? These general rules of thumb might help. If the editor or agent has specifically said that they’re open to new work, they’re not going to mind if you don’t have an MFA or a slew of impressive awards. You can be brief and honest. They just want a short paragraph, literally a few lines, to put your submission in context. They often use this paragraph for the "Contributors’ Notes" at the back of the journal if they accept your story. They don’t have to worry about soliciting it later on if they get your bio up front. If you've been published in other literary journals or have an MFA or both, toot your horn. You should list these things first. A clean and acceptable "short bio" with credentials might go something like this: "John Doe received an MFA in fiction from Writing University in 2006. He stories have previously been published in Writing Magazine and Best Fiction. He lives in Ontario, Canada." 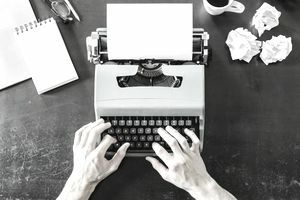 Most bios are on the dry side, but take a look at those of other writers in the journal to get a feel for what the editor or agent is looking for. You can be a little creative if it looks like they’re open to something more colorful. Reading real bios from published writers can give you a framework to get you started. John Doe's bio above says just enough. It doesn't distract from the story he's submitted. You don't want your bio to be a turn-off for an editor. You don't want her to begin wishing she could stop reading before she gets to the end of it. Do remember that if you despair over using the third person, you're a writer. Don't forget that self-deprecation lends an aftertaste to your work. Do remember that your pets don't mind being left out. Don't forget to never overstay your welcome. Consider using the three-sentence rule. Even if you have more published works than Shakespeare, don't try to list them all. Pick the very best and let the spotlight shine on them. If you've won more awards than Katherine Hepburn, stick to the most prestigious. If you want to mention where you live, that's fine, but there's no need to describe the view from your window. You might want to write several bios. Put them aside and forget about them for a day or two, then go back and look at them cold. You might be surprised to realize that you see them in a whole new light.